This is a tale of two baby girls, both born in 2003. One of them started high school today, the other did not. One child was born near Moscow to a woman who had had no prenatal care and who left the hospital without her baby. The infant was premature, seriously underweight, and weak, and her future in a Russian orphanage looked bleak. A few months later, halfway around the world, the other little girl was born into a loving California family — a beautiful baby, the picture of health, with a promising life ahead of her. Shortly after her first birthday, after a year of unthinkable deprivation, the Russian baby’s life was forever changed when she was matched — by fate? accident? dumb luck? — to a New York couple who welcomed her into their life and started her on her long journey to health. It took several years of therapy — speech, physical, occupational — but she caught up, and by 5 she was taking gymnastics and playing soccer and baseball. Anna was and is a success story, the poster child for early intervention and lots (and lots) of luck. The other little girl was 7 — also a soccer player and gymnast, and the light of her family’s life — when she, too, was unthinkably changed. 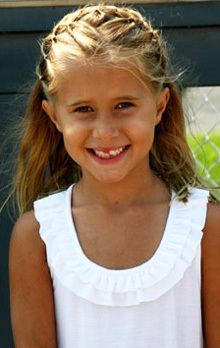 McKenna was diagnosed with a rare and inoperable brain tumor, and she soon lost her ability to run and play; she died a few months later. Fate? Accident? The worst luck in the world? Today McKenna is a literal poster child — hers is one of the banners lining the corridor of the Children’s Brain Tumor Project lab at Weill Cornell Medicine. My child started high school today, with all the pride (mine), excitement (hers) and anxiety (shared) that every family should experience as they reach these milestones. But I couldn’t stop thinking about that other family, on the opposite coast, whose little girl did not start high school today, who is forever 7 years old. What diametrically opposite paths these children took — one from disaster to recovery, the other from promise to despair. It’s not just the coincidence of the 2003 birth year that binds me to McKenna’s parents (although the first time I met her dad and realized our girls should be the same age was the last time I had any emotional distance from my job) or to all the other parents I know who suffer through the endless back-to-school photos every September. It’s that sense of chance, fate, accident, whatever it is, that can change any life, any time, for good or ill.
None of us know, ever, when the winds will change. In my work here, I’ve come to learn more about pediatric brain tumors than any parent should, but I’ve also learned about aneurysms, spine tumors, and dozens more ways that the central nervous system can go suddenly, horribly wrong. I know about brain tumors that typically strike children under age 10, and for a moment I think I’m “safe” because my younger child is now 11. But I’ve also known about teens who are stricken, or young adults, or people in mid-life, and I know that I am never safe. None of us is. September is childhood cancer awareness month, when my world (and probably yours) is filled with pleas for better awareness, more funding, accelerated research. I want all of that. But mostly what I’d love is for all of us to take a moment and recognize how easily it could be us, how fast we can go from the sidelines to the battlefield. It could easily have been my child who one day started throwing up for no reason, or whose eyes crossed for the first time, or who suddenly couldn’t maintain her balance. It could have been my child. And I know it still could be, one day. I know I am not immune. I hear bereaved parents say every day that we should treasure every moment, let our kids have extra ice cream and jump in muddy puddles. I believe them, and I do try, but there are still plenty of times I say no to the extra scoop and please, not in the mud with the new basketball shoes! I just can’t live my life expecting my children to be diagnosed with a terminal illness — I have to watch their cholesterol and protect the Air Jordans, I have to assume they will live long and healthy lives. I don’t think I could get out of bed every day if I didn’t. But still, I know every day that it could happen. It could be my child. It could be yours. It could be anybody's child. These terrible diseases don’t discriminate. It does seem a little cruel that this month of new sneakers and notebooks and back-to-school photos is the same month in which we see gold ribbons and shoelaces and other reminders of childhood cancer. But as I posted my photos, I took a moment to think about McKenna, and how easily she could have been my child. My kids are healthy — today — and that’s all I have. It’s all any of us have.